I got a 20+5 gooseneck 20,000lb capacity. I'd like to figure out a way to put removable log standards on it. I need 10" from top of deck to bottom of log for fork access. I'm wanting to haul some pine in for pulpwood anybody got a safe reasonably priced idea? A while back, Yellowhammer posted this information on his trailer. I found it very helpful and think that you will too. Guys around here that haul on goosenecks or flatbed trucks just build a set of bunks and have stubs on the bottom that fit into the stake pockets. A piece of cable with a clamp or piece of chain and a bolt hold them in on each side. 10" seems like a lot. Most bunks around here sit 4-6" off of the flat. 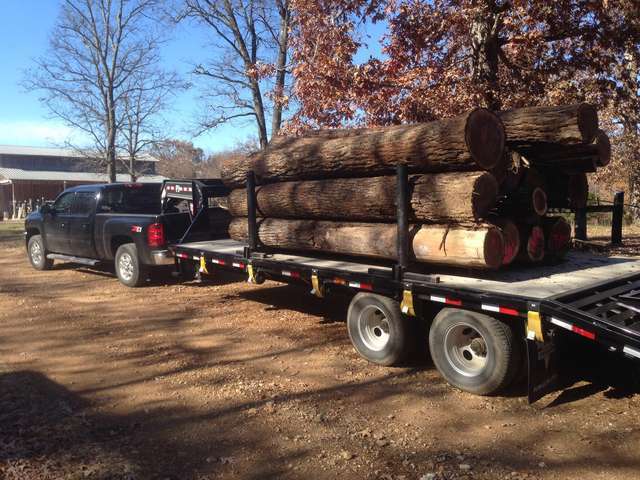 My truck has no flat just a set of bunks, I think I have about 6" of clearance from bottom logs to the frame. I'll have to measure. I would use 4" sq. tubing to build em, or 4-6" I beam. Put gussets in the corner of the bunk and standard. 10" is the spec mead/glatfielter gave me. They have a log yard about 15 minutes from the house. 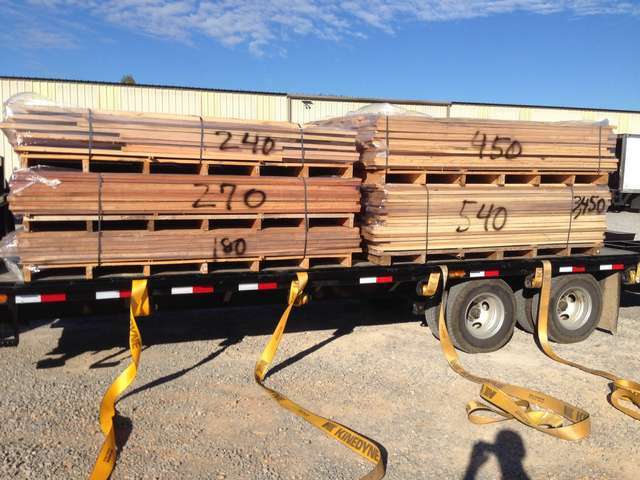 I'm trying to get a hold of another guy to see if he buys pulpwood and how it can be delivered. I know he has a chipper because they sell semi loads of wood chips. If I had to have 10" above deck on my 22 + 5 ft 24,000 lb gooseneck I would find a different place to sell to if at all possible. I use 4x6 oak to space with and have never had any issues unloading but I sell to smaller mills that are careful of others equipment. Father & Son Logging and sawing operation . I think your right, I have a neighbor who trucks utility poles for a living and has a big john deere front in loader to load the poles with. I measured the forks and got no where near 10" of thickness. I looked at a job and would have sold pine veneer to GP, they wanted a 10" bolster as well. The issue was their crane had massive wedge forks that were 8+ inches thick at the rear. Of course it would lift an entire semi bolster of logs at a shot so it had to be beefy. For a variety of reasons I did not take that job. I have a 20K gooseneck PJ dump trailer that the sides come off of and I built bolsters out of 4"X4"X3/8" tube steel for the vertical stakes, 6' tall, and 4"X4"X6" for the horizontal portion. Gussets in the corners and a gusseted triangle on the bottom bolster that has 4 - 3/4" bolts going through it into the floor of the trailer so I can remove them when not wanted and put the dump sides back on. I have a 25K lb gooseneck trailer, I haul logs, farm equipment and lumber every week and have been very happy with these bunks. They are 4 inch off the deck, and I get a lot of logs from commercial mills where they use either big articulated loaders or Pretice loaders and have never had any issues. The standards are removable, the bunks are removable, and since the upright studs are pierced and welded into the bunk tube, the stake pockets take very little of the log load, so no chance of bending or tearing them out. The whole thing is removed in minutes. trailer with two uprights removed to make unloading these big cherry logs easy. maybe that's why, I just assumed they had a large front end loader, I'll make a trip over there and see what they have. If they won't take 4-6" bolsters then I'll find somebody else, or just use it for firewood. I was just trying to sell something that way Uncle Sam thinks I'm trying on my 1040f. With that set up YH, You must have a CDL-A for that? Thanks yellowhammer, I will definetly be making mine like yours. I may have missed something along the way, but I read the DOT regs regarding log bolsters when I built mine and I don't think the tube in a tube without a pin or bolt holding it together is completely legal, may want to check to be sure. Just hate to see either of you get pinched by somebody trying to make his numbers for the month. That was one thing I am going to add to the design. I don't have a cdl, so I'm not going to give them a reason to ticket me if I can help it. I fall under ohio's farmer and 150 miles from home. Thanks for that, it's an easy thing to add. I sure don't mind making things safer. I've got pins holding the stakes in the trailer sides, no problem putting pins in the bolsters. This is the second Chevy 2500 diesel I've used to haul with, and I'm always amazed at the power and ease of towing. A little backstory, this was my third iteration in trying to come in with an all purpose, convertible gooseneck. I've tried two other brands of trailer and other bunk configurations, but never was happy. 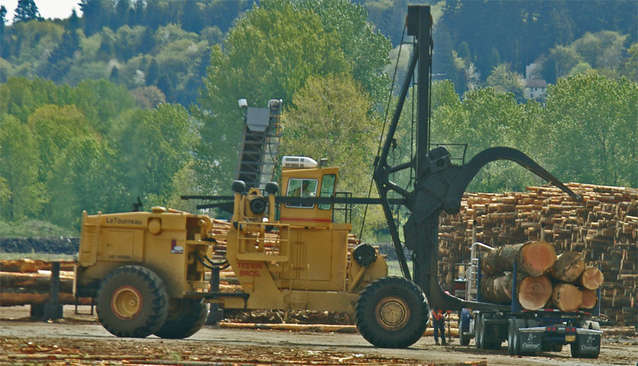 When I rolled into the log yard for the first time with this rig, the loader operator looked at me from his cab and gave me a big thumbs up. I've been using it ever since. Last year I met YH and of course did a good inspection of his rig. 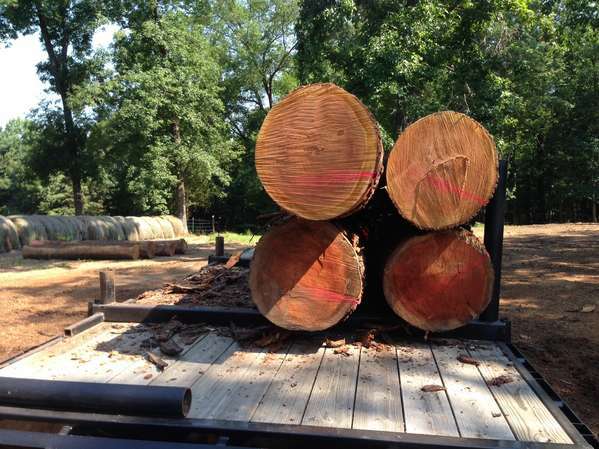 Since starting logging this fall i sell tons of Ply logs on professional trailers of differing types. On those locations the industrial standard is giant forklift that really requires a lot of room. Think of it like this...a grapple top forklift that lifts 30 PLUS tons in one lift and delivers the load over there ...every few minutes. I give YH the THUMBS UP for his developed idea that should be the answer for most of us...as long as we stay away from the rather large mills. Something like this needs more room! But very few smaller trailers are going to deliver to this type of unit. I had lots of good times in BC delivering to the big guys. Yes sir your right, I just found out the other day that this is the reason. The loader was bought at a local heavy equipment place, brought in piece's on several semi's and put together there, then drove up the road a few miles to the log yard. It will unload the whole truck on one grab. I'll have to build mine with the 10'' space or find another buyer. I'm thinking another buyer.